Pity the poor Boggle enthusiast. While there may be umpteen versions of Sudoku, hot game of the 2000s, at my last count I could find only seven variations on the “classic” (read: really big in the ’80s and on “King of the Hill”) word game in which you form as many words as possible from a random grid of letters. Given that Boggle is trademarked by Parker Brothers and Hasbro, I fully expect that the Facebook knock-off Scramble will go the way of Scrabulous before too much longer. And perhaps these games on the App Store will vanish, too. But in the meantime, I’m happy to report on the state of the art of iPhone Boggle games—thanks for asking—and am happy to report that two of the games are quite good. Boggle’s rules can vary. While the standard version includes a 4-by-4 grid, some games offer a 5-by-5 variety instead. While most games limit you to words that are three letters or more, you can increase the difficulty by requiring that words be longer. Games usually have a time limit, and for the most fun you should be able to compete with friends to see who can get the most words on any given board of random letters. I have to admit I would have never considered the iPhone as a platform for Boggle, a game I played some as a lad but, like Scrabble, really came to appreciate by playing umpteen games on Facebook. Yet it turns out that the iPhone is a fantastic format for the game. Wurdle is extremely customizable and has a friendly drag-to-select interface. Two Boggle-inspired games stand out from the crowd. They have their most important feature in common: to find words, simply trace them with your finger. When you pick up your finger, the games automatically check to see if the word you’ve chosen is valid, and adds it if it is. It’s a much more natural approach than the other games, which require you to tap each individual letter and then press a separate button to submit the word for evaluation. 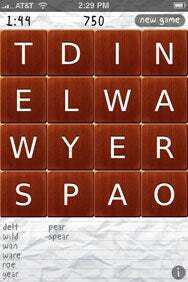 Semi Secret Software’s $2 Wurdle is an excellent implementation of Boggle. It offers 12 different tile styles; three different game lengths; grids from 4-by-4 up to 8-by-8; minimum word lengths of 3, 4, or 5 letters; a choice of dictionaries, a high-score and longest-word lists, and online high-score integration. Beyond the mind-boggling array of customization features, Wurdle has a great set of sound effects that give you feedback as you drag your finger and let you know if the word you’ve chosen is valid or invalid. The only thing I didn’t like about it is the fact that you can’t choose when to start a game—when you open the program, it immediately starts one for you. Quordy offers a beautiful interface, pass-along and network challenge play, and an easy drag-to-select interface. Lonely Star Software’s $3 Quordy offers high-score lists, including online integration. It’s got the most attractive interface of all the games I looked at, including a beautiful word list. It’s also got a pass-and-pay mode, which allows you to work on the puzzle and then pass it to a friend who can compete with your score—great for passing time when you’re stuck somewhere with a friend. And it’s got an online play mode, where you can challenge friends also running Quordy on their iPhones. The program also offers a lot of small touches, including vibrating the phone when you’re running out of time and displaying the amount of time you have left in a pie-chart format. However, you can only play with a 4-by-4 grid. 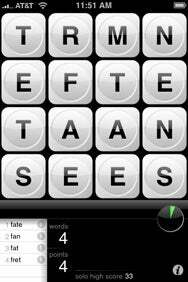 The other Boggle-ish apps all require that you tap each letter individually, and then tap a box in order to submit your letter and see if it’s valid. It may not sound like a bad interface approach, but it pales in comparison with the trace-your-letters interface offered by Wurdle and Quordy. Two of the apps I looked at aren’t “traditional’ Boggle at all. TheMacBox’s $1 WordTrail offers only a 3-by-3 grid, there’s no timer, and each puzzle includes a hidden nine-letter word. Cogstorm’s $3 Word Jam is limited to a 4-by-4 grid, but lets you adjust the amount of time per game and includes a high score board. It’s not real Boggle in the sense that when you pick letters to spell a word, they’re replaced by new letters. It’s clever and challenging but not really the same game. Among the more traditional Boggle games, there’s Fusion Bay’s $3 Wordabble , which has an impressive array of features, including an online “puzzle of the day” competition, strong high-score and rankings information, and an attractive game board. You can play games in either timed or untimed modes, view puzzle solutions when the game is over, and even see word definitions. It offers only a 5-by-5 grid. If it was a bit more flexible and offered the drag-to-select interface of Quordy and Wurdle, it would be a serious contender. The two other games I looked at were pretty basic implementations: Devare.com’s $1 iBoggle has a name that will likely draw the attention of Parker Brothers and Hasbro lawyers. It offers only a 4-by-4 grid. And Tim Gerla’s $2 Boggart most likely won't draw the attention of J.K. Rowling's lawyers, and has a 5-by-5 grid. If you’re a fan of “classic” Boggle, Quordy is the best program out there. It’s got a great interface and its pass-and-play mode is a lot of fun. However, if you prefer modifying your Boggle set-up in any way—altering the size and appearance of the board and changing the minimum word length—Wurdle is the best choice. For me, Quordy has the edge, but I also appreciate the flexibility of Wurdle. You can’t really go wrong with either of them. And given how cheap they both are, you don’t really have to. All programs mentioned in this review are compatible with any iPhone or iPod touch running the iPhone 2.x software update.